Ooooh how I love sewing my own lingerie!! 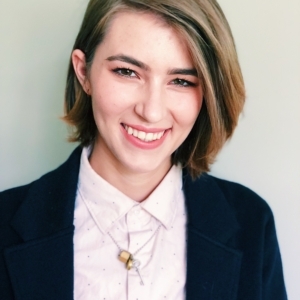 There are so many little ways to make a bra or pair of undies totally unique, and just exactly what you love to wear and feel comfy in! One of my favourite fabrics to work with is stretch lace. It can be so soft and lovely, and it has such a beautiful romantic effect when used in lingerie! Stretch lace can be difficult to find, at times, but Britex really has some incredible pieces to choose from!! As soon as I saw this deep blue corded lace, I immediately thought of this black and blue Euler Bralette!! 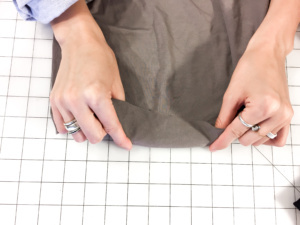 When choosing stretch fabrics for your sewing projects, it’s very important to know the degree of stretch that the pattern is intended to work with. The degree of stretch refers to how stretchy a fabric is, and is measured in percentages. 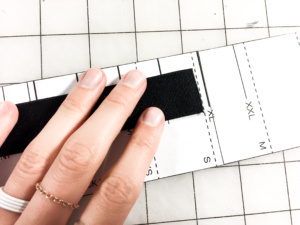 This is important to know, because if a pattern is intended to be used with fabrics at 75-100% stretch, and you use it with only a 25% stretch fabric, your garment will be too small when it’s finished!! But don’t worry – it’s very easy to figure out! The way to measure the degree of stretch is to take four inches of fabric, and just see how far it stretches!! Each inch is 25% stretch. The fabric I’m using here is a bamboo rayon jersey, and it’s one of my absolute favourites!! You can see it has stretched two inches, and is therefore a 50% stretch. 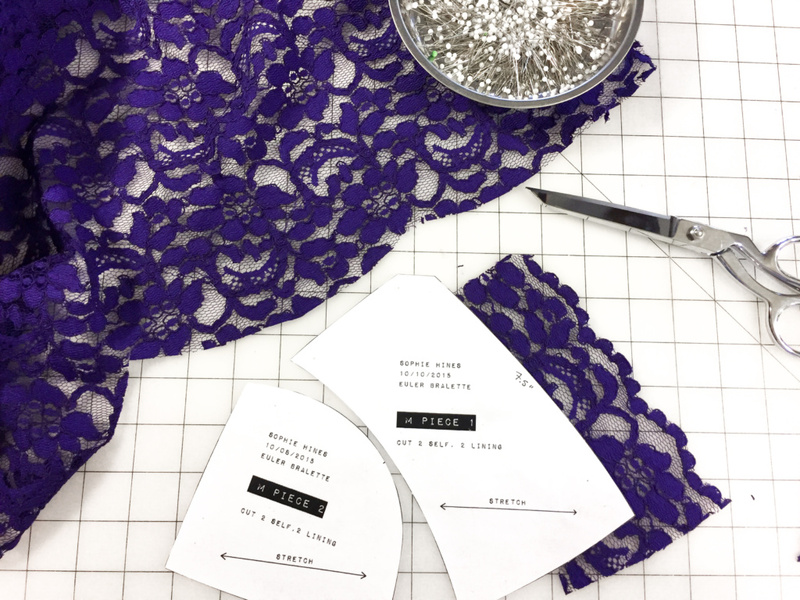 Now as luck would have it (or possibly it’s just math and science), there is a super easy way to use fabrics that don’t have the proper amount of stretch for the pattern you want to use it with. My rule of thumb is, for every additional 25% of stretch your fabric has, go down one pattern size. 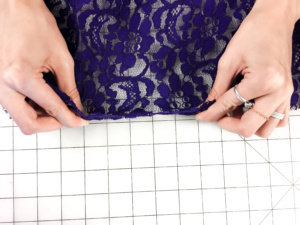 For every 25% stretch that your fabric lacks, go up one pattern size! So if your fabric is super extra stretchy, you make a smaller garment because your fabric will stretch that much extra. If your fabric isn’t as stretchy, you make a bigger garment that doesn’t need to stretch as much! You can see here that my lovely blue lace has only a 25% stretch, when I need it to stretch 50%. I wanted to make a bra in size Small, so following my rule, I went up one pattern size in my cups, and cut a size Medium. Now remember, I only want to go up a size in the cups where I’m using the lace, and will keep the size Small for my straps and underbust band. 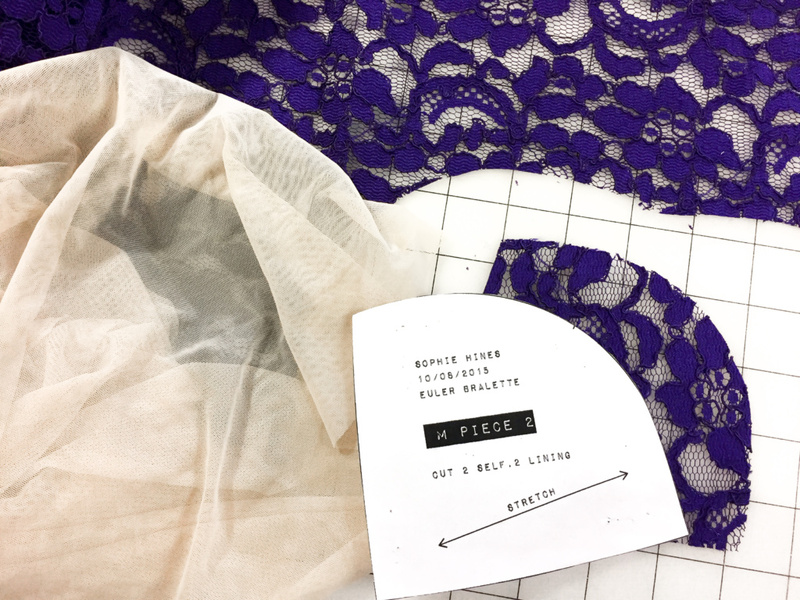 Now, while I want the bra to be sheer and unlined, I do want my center seam to be enclosed, so I’ll be lining the side cup piece with a lightweight tan stretch mesh. This lace doesn’t have much stretch and has quite a bit of structure to it due to the cording, so I used a very light mesh, as I don’t want to make the bra any stiffer! For my side cup elastic bands, I did use a size Medium to match the size of the cups. 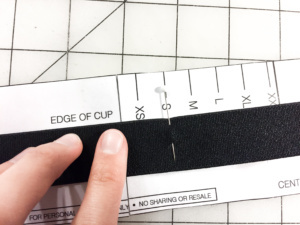 Cutting the underbust band – choose your normal size. The edge of cup marker will also be for your normal cup size, and our larger cups will just be gathered in to fit perfectly! Ta Da!! A beautiful lace bra, made with a different stretch and fits perfectly! Just what we wanted. Check out all the amazing laces and stretch fabrics Britex has in stock, and don’t forget to post your adventures in lingerie on social media for us to see!! Tag us at @sophie_hines and @britexfabrics so we can see your incredible projects! !